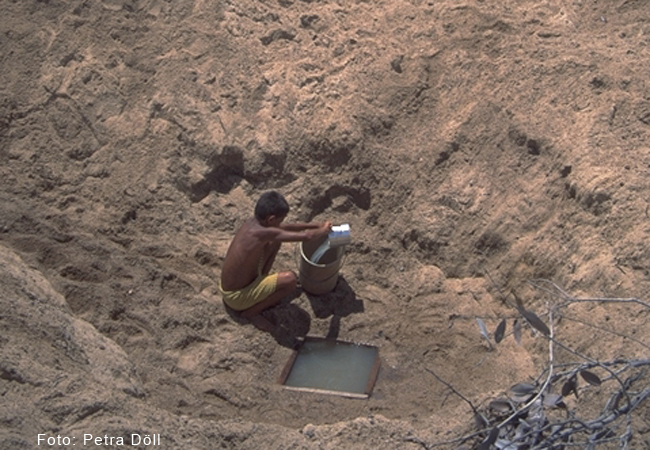 Access to clean water is a major challenge facing many people, such as this boy in the semi-arid Northeast Region of Brazil. Photo: Petra Döll. Foto: Petra Döll. What difference does it make to the Earth’s water resources if we can limit global warming to 1.5°C instead of 2°C? A research group led by Goethe University Frankfurt has simulated these scenarios with global hydrological models. An important result: High flows and thus flood hazards will increase significantly over an average of 21 percent of the global land area if the temperature rises by 2°C. On the other hand, if we manage to limit the rise in global warming to 1.5°C only 11 percent of the global land area would be affected. According to the Paris Agreement on climate change of December 2015, the increase in global average temperature should be kept well below 2°C compared to pre-industrial levels, if possible even below 1.5°C. To find out what the two scenarios mean specifically in terms of reducing risks for the global freshwater system, the Federal Ministry of Education and Research commissioned a study which has now been published and is intended for inclusion in the forthcoming special report by the Intergovernmental Panel on Climate Change (IPCC) on global warming of 1.5°C. As the research group led by Professor Petra Döll from the Department of Physical Geography at Goethe University Frankfurt reports in the current issue of “Environmental Research Letters”, it used two global hydrological models for the analysis, which were “fed” with a new type of climate simulations, known as HAPPI simulations. These are more suitable than previous types of simulations for quantifying the risks of the two long-term climate goals. By calculating seven indicators, risks for humans, freshwater organisms and vegetation were characterized. “If we compare four groups of countries with different per-capita incomes, those countries with a low or lower middle income would profit most from a limitation of global warming to 1.5°C in the sense that the increase in flood risk in those countries would remain far lower than at 2°C,” explains Petra Döll, first author of the study. Countries with a high income would profit most of all from the fact that rivers and land would dry out far less in the dry months of the year. Professor Döll performed the study in cooperation with the Potsdam Institute for Climate Impact Research and Climate Analytics in Berlin. She is an expert on water and has been investigating the potential impacts of climate change on the Earth’s freshwater systems for twenty years.